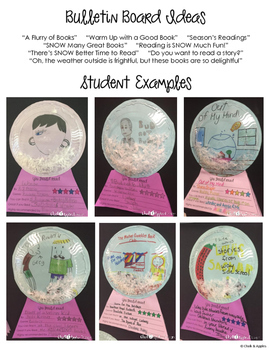 Encourage students to discover new books with this winter craftivity. 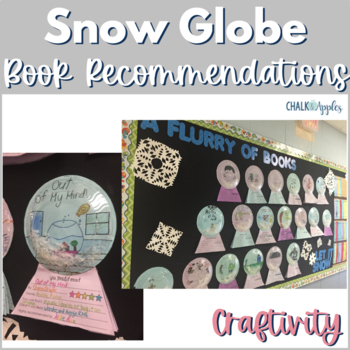 Students will love creating a snow globe book recommendation for a favorite book, and this makes an adorable winter bulletin board! 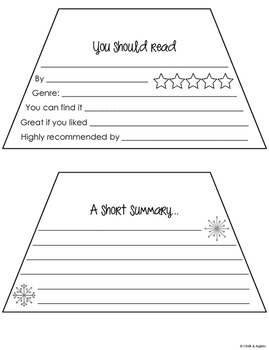 Includes student printables with instructions and teacher tips for assembling the snow globes. You will need: craft snow, clear dessert plates, and a hot glue gun to complete this craftivity. Having difficulty with a file? Visit the FAQs section, submit a help ticket, or ask a question on the Q& A tab before leaving feedback. Be the first to know about discounts, freebies and new resources! • Click the green star to get email notifications about new resources & sales. • Find me on my blog – Chalk & Apples, Facebook, or Instagram. • Go to your My Purchases page (log in first). Click on the Provide Feedback button to leave a rating and a short comment. You’ll earn TPT credits, which you can redeem on future purchases! Copyright © Chalk & Apples. Please purchase additional licenses if you intend to share this product.